Women love fashion and, if you look around, almost every corner has a beauty salon of some kind. Running a beauty salon is not easy, especially when the economy is difficult. Someone once said: “If it is your passion, then make it your profession and you will see a success.” However, when running a business, it is not always the case; your passion can only get you so far as an entrepreneur. Below, we will focus on owning a beauty salon and what the biggest challenges are when you are in this industry. Every business faces some struggles in the beginning. The most important element when running a business is to keep an eye on your competitors. Trends are changing every day, it seems; make sure to stay updated with the latest fashions (haircuts, dying, nails, etc.). Hire beauticians who come with an extensive background of trends. And, if not, offer a training program to get your employees up to speed. The services provided by your beauticians will have a huge impact on your business progress. Your employees are your business asset. As a business owner, it is your responsibility to encourage and motivate them. When an employee believes that their employee will take care of their needs, they will be willing to loyally stand by the business, through good and bad times. Offer incentives such as a bonus, gift hampers, or even health insurance. If you offer them support and make them feel secure, they will be one of the most positive assets to your salon. Managing staff is not an easy job. Be friendly with your staff, avoid confrontations when you are dealing with issues, allow them leaves on holidays or when sick, etc. The more flexible you are, the more willing they will be to go the extra mile. One of the most basic challenges that business owners face is getting clients. Different businesses use a wide variety of tactics to attract clients to their services. Think of different marketing ideas, give attractive discounts, run special offers, and let people know you are there. Word of mouth is a great marketing tool; do not rely on social media only, although it is a great way to let people know about your salon. Display prices at the front desk, along with special offers. When your client leaves the salon, try to make sure they have already booked their next appointment. Offer them lower rates compared to other salons. Create an ambiance in your salon that will make your client feel like home and relaxed. Involve your client in discussion about fashion and trends – women (and some men!) love talking about it. 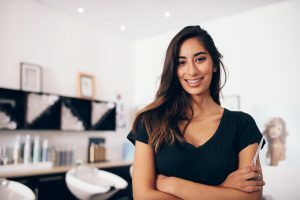 At times, there will be walk-in customers; many salons give priority to clients who already have an appointment, but walk-in clients give your business a boost as well, make them feel welcomed. They could possibly become a long term client. Initiate a program where clients earn points for every service they get. When they have reached a certain amount, give them a free service or product. Another great way to bring clients to your salon is giving vouchers on their birthday. Women love to be pampered on special occasions. Maintenance of your salon is another important aspect that will help you bring your clients back to see you. No one wants to go to an unhygienic place to get their services done. Decorate your salon in a lavish, trendy style to make it attractive for clients. Pay special attention to lights and chairs and use fresh, natural oil diffusers; they help create a warm, inviting ambiance. However, when maintaining your salon, keep in mind the expenses that you will bear. It is important for any business to keep track of their expenses. If you find it difficult, hire an accountant or bookkeeper for your bookkeeping needs. Choose a product that you believe in. Your clients put trust in your choice, so make sure that the product is of high quality. Learn about different products and share your knowledge with your clients. Your product sales can bring a lot of profit to your business. If you feel uncomfortable selling, then just acquaint your clients with the products you are using on them while providing services. Most importantly, do not be pushy when selling different products. Owning a salon is, no doubt, challenging, but also rewarding and fun if you love it. Come up with strong strategies to ensure a successful business. Keep in mind, there are challenges in every new business, do not give up. Work with key performance indicators to measure your company’s growth. Avoiding Bankruptcy Embezzlement: Is There a Fox in Your Financial Hen House?